If you’re an agency looking to add email marketing to your services, you’re going to need some white label software that allows you to manage multiple client accounts and apply your own branding. As a professional agency, you don’t really want software logos all over your reports and dashboards, especially if you provide client access to the platform. Of course, you could build your own email marketing software but this isn’t always realistic – or even necessary when there are excellent platfoms already offering white label solutions. Here are the best white label email marketing tools for agencies. What is white label email marketing software? White label email marketing software allows you to remove the branding from existing platforms and customise their dashboards to a certain extent. The idea is to allow agencies to provide email marketing services by using these platforms, instead of building their own software solutions. Well, you’re going to need to provide your clients with reports to show them how your services are making an impact. In many cases, you’re also going to want to give your clients access to certain parts of the platform so they can access reports for themselves or even create their own email templates, campaigns, etc. Regardless of how much access clients have to your email marketing platform, you want your agency’s logos, URLs and other branding elements to be there – not the branding of your software provider. This is the key selling point of white label email marketing solutions and we’ve got five of the best options for your in this article. SendinBlue is a great email marketing platform and we use it here at Venture Harbour for sending transactional emails. It doesn’t provide the automation features we need and it lacks a little on the integration side of things for us, but SendinBlue is a highly capable piece of software all the same. With its white label offering you can customise URLs to match your domain, add your agency logo to the interface and create custom reports for different clients. Overall, it’s not the most customisable white label option but you do get multi-language support, which could be crucial if you’re dealing with clients in foreign-speaking markets. ActiveCampaign is our main piece of email marketing software and it’s the platform’s excellent automation features and integration options that sealed the deal for us. As a white label option, ActiveCampaign also gives you more freedom than SendinBlue, as well. Aside from custom domains and logos, you can also modify the style of the interface itself to match your brand. As long as you’re happy to tweak some HTML and CSS, you can change the colour of buttons and borders, change font styles and other design elements. You can also remove buttons entirely or add them to other parts of the interface. Crucially, ActiveCampaign makes sure all references and links to itself are removed from the platform. Campaign Monitor is much like a stripped-down version of ActiveCampaign, offering email marketing and automation but with significantly fewer features. You can view a feature comparison at Marketing Automation Insider to see how much these differences matter to you. Campaign Monitor’s approach to white labelling its software is a little different and it actually tweaks the navigation structure for agencies, making it faster for you to move between client accounts, campaigns and billing details. It’s a relatively simple modification but it makes a real difference to using the platform as an agency. Besides that, you can also create customised permissions and workflows for different client accounts for more granular control. mailingmanager’s white label solution is designed to make it easier for creative brands to add email marketing to their list of services. The emphasis is on getting clients to sign up for free trials, use your rebranded version of the platform and then sign up for a monthly subscription. To make this work, mailingmanager gives you a 100% white label solution that you can fully customise to match your brand. There’s no limit on the number of clients you can have on board either, so you’re never going to be held back from developing this as an additional stream of revenue. You also have automation and CRM features rolled into the platform and mailaingmanager has automation workflows specifically for agencies to turn free trials into paying customers. 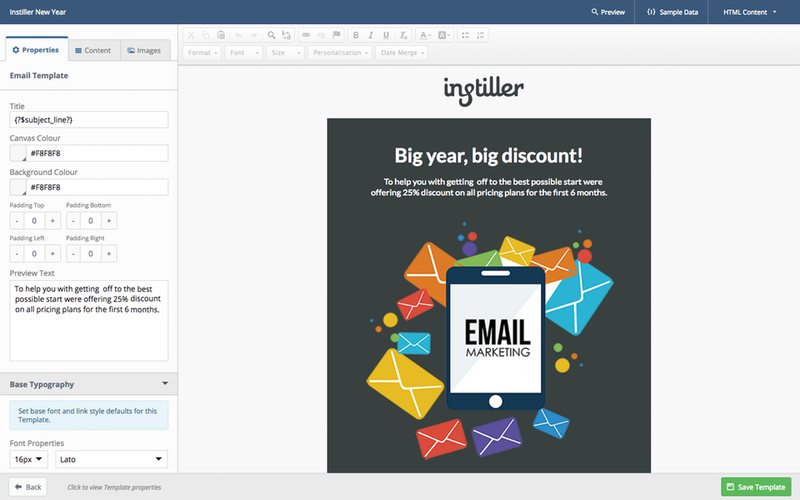 Instiller is purely a white label email marketing solution designed for agencies. This means the platform is designed from the bottom up for agencies that want to offer email marketing services. You get a 100% white label solution, allowing you to customise domains, logos and design styles to match your brand. Instiller also gives you unlimited client accounts and there’s the added bonus of being able to create unlimited team member accounts, too. Which is the best white label email marketing platform? First of all, you need to make sure you have all the email marketing features your agency and clients need. Then, you need to be confident you have the freedom to customise the platform sufficiently – otherwise, there’s not much point in going white label in the first place. Finally, you also need a solution that provides the usability your agency and clients demand. This depends entirely on how your agency works, the tools you need to integrate with and how much access you plan to give your clients to the platform. For example, will you only give them access to reporting or will you allow them to create and manage campaigns for themselves? If you’re looking for a recommendation, ActiveCampaign gives you all the email marketing, automation and CRM features you could ever need – you don’t need to worry about that. You also get a lot of room to customise the platform – from domains and logos to button colours and font styles. For the vast majority of agencies, this should be more than enough. If you need (or want) a little more freedom to customise the finer details, then it’s worth taking a look at mailingmanager and Instiller, two truly 100% white label platforms. Whether they can provide the features you and your clients need is something only you can decide.